As I think I've mentioned, we were home (at our house) for Easter this year. Traveling while being this pregnant did not sound appealing to me. At this point, I'll only travel if a little brother of mine is getting married (which he is, in a few weeks). This was our very first holiday (Thanksgiving, Christmas, Easter) spent in our house in the 11 years we have been married. Yes, the first. It was nice to stay put. To invite people to our house. To make holiday memories here. My sister and her family joined us, as did our neighbors- a couple next door. 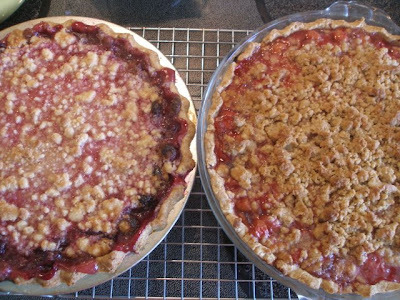 For the special occasion of Easter, my sister and I prepared ham and gravy, pineapple stuffing, green bean casserole, pickled Easter eggs, mandarin orange jello salad, blueberry muffins and jam, grape pie, sour cherry pie, vanilla ice cream and an outdoor Easter egg hunt. It was nice to be together, to eat too much, to watch the kids get excited about Easter eggs and to remember the reason why we celebrate Easter. Having Easter at our house may just become a new tradition. Your table setting looks so beautiful...sounds like a nice day. And I cannot BELIEVE those pickled eggs! So vibrant. 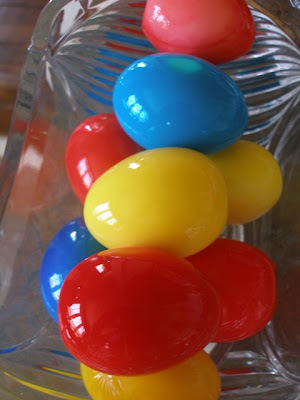 Oh my goodness...I thought they were plastic eggs becaus the color was so bright...!! Thanks for the compliment on my chicken coop. Isn't it wonderful!? I'm so excited...!! I love your napkins. 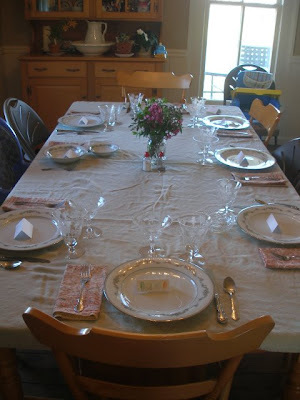 I have a rag tag batch of cloth napkins that we are wearing out so I guess that is why of all the things you write and show here in this post I choose to comment on the napkins. Glad you had a happy Easter.